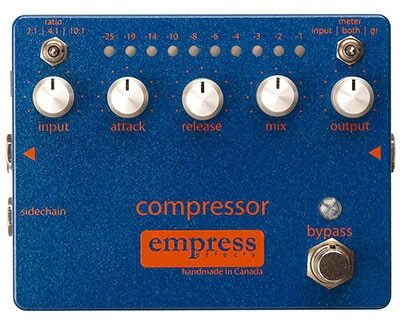 Finding the best bass compressor pedal should be one of your first priorities after your guitar and amp. 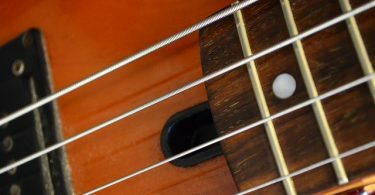 It can help thicken up and smooth out your playing, and it’s essential for certain styles of music. Looking for the best bass compressor pedal? I’ve got you covered. Picking the right gear for this essential task can really transform your sound and give you a thick, full-bodied tone that’s as smooth as butter. What Is A Compressor Pedal? It’s important to first understand what a compressor pedal is, what all the knobs do, and why you should be getting one in the first place. It’s one of the most essential parts to any great bass rig, and it’s usually one of the first pedals you should think about purchasing. A compressor pedal is basically a tool that will automatically adjust your volume in real time as you play guitar. When you are playing bass, your dynamics tend to be all over the place. Some notes might be louder than others, and you might not hit others quite hard enough. This is something you don’t really want in something like rock music. Instead, you’d want all the individual string hits to be equal in volume for the most part. The compressor will take all those really loud hits and squash them down. How loud the sound has to be before it gets squashed is determined by the threshold dial. The attack dial is used to determine how quick that squashing kicks in after a note is played, and the release is used to set how quickly the effect wears off. After that, you can use the ratio dial to determine the overall amount of compression. While it’s at it, the compressor will also raise up any sounds that are really low giving you a much more even tone all around. As you’d expect, the overall volume of your guitar gets diminished, but most compressor pedals have a makeup gain knob where you can raise the volume back up to how you like. 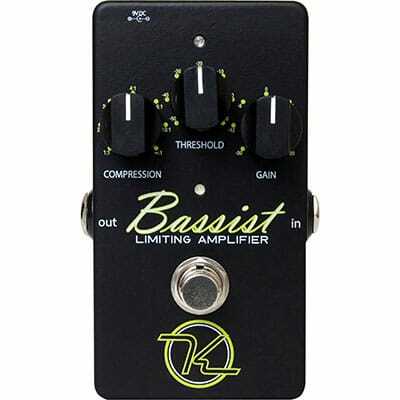 So Why Do Bass Guitarists Use A Compressor Pedal? Without having to dial up the volume like crazy on your bass, some added compression will give your low end a fatter, meatier punch, and all your high end stuff like harmonics will be much more noticeable and smooth sounding. Overall it leads to a smoother, fuller, and more even tone all around. 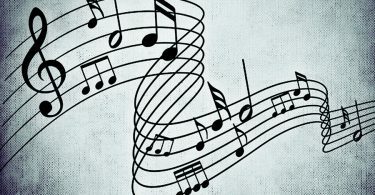 While not highly necessary for something like jazz or classical music for fear of removing too much dynamic range, it’s great for styles of music like rock or metal where you need a punchy and in-your-face bass sound. Pair it up with a looper pedal and some decent pickups and you have yourself a great setup for every occasion. Swedish manufacturer EBS developed this compressor pedal in order for bassists to achieve the most transparent-sounding compression as easily as possible - and they nailed it. At first glance this looks like a very simple compression stomp-box, which it is, but under the hood are some interesting features that make it stand out from the crowd. First of all, the construction here is great. The box has enough weight to it that it won’t slide around when you stomp on it, and this is aided by the non-slip foam on the underside. The dials feel extra sturdy as well - something that a lot of other compressor pedals lack. The controls are simple. Besides the on/off stomp switch there is a comp/limit dial which allows you do set the ratio (how much compression there is basically), a make-up gain dial for for bringing the volume back up, and a 3-way mode switch button. The first mode, “Normal”, is just a standard 1-band compression. The second mode called “MB” is a dual-band compressor, and the third mode called “Tubesim” is basically the normal mode with some extra harmonics added on top for some valve-warmth. You won’t find any attack, release, or threshold knobs here, but to be honest you don’t really need them. They just add to the complexity and it sounds great as-is. If you really desire, you can actually open up the metal box and tinker with the threshold settings for the MB mode using the 2 trim-pots inside. It’s not as ideal as having knobs for it, but it’s definitely doable. The “Normal” mode sounds pretty good here and it really adds some thickness to the bass sound. Flicking over to “MB” mode is where this unit really shines though. It creates a much more natural sound, and the lower end is not affected as much when you are doing some high-end plucks or thumb-slaps. Having separate compressors working together for each the low and high end makes such a huge difference in the quality of the sound. The “Tubesim” mode is similar to the standard although it adds some extra harmonics on the high end for added warmth. It sounds great, but for most of the time I find myself using “MB” mode. Add in the fact that you can power the unit via the input jack from a 9V phantom supply and you have yourself a solid choice for ​top bass compressor pedal for the money. ​Check out the price and ​full specs on Amazon. 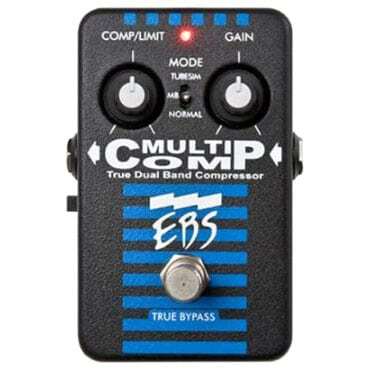 Here’s a great little multi-band compression pedal that’s about half the price of most others on the market. The problem with some single-band compressors is that you either end up sacrificing the high end compression in order to get a beefy low-end, or you end up sacrificing and thinning out the low-end in order to make the highs sing. With this multi-band compressor it will put on different compression amounts for different frequency ranges leading to a smooth and full tone. You can think of it as having different compressor pedals for your low, mid, and high strings - but the great thing is that it’s all in a tiny package that barely takes up any room on your pedalboard. Despite the simple 1-knob setup that controls the amount of compression, there are actually unlimited possibilities under the hood. You can use the TonePrint app on your phone to select from a wide variety of user presets created by professional bassist all over the world. If that’s not enough, you can hook up the pedal to your PC or Mac and launch the in-depth TonePrint Editor software. In the program you have complete control over everything imaginable when it comes to sculpting your perfect preset. This pedal also features a TrueBypass output which keeps your input signal completely uncolored. 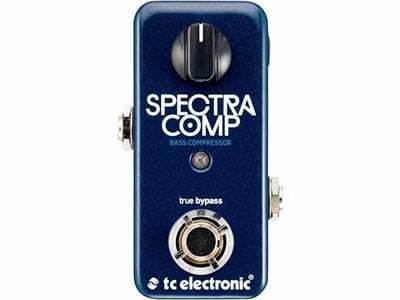 If you are looking for a simple, great sounding, and cheap compressor pedal for bass, this is it. Check out the price and ​full specs on Amazon. This Italian-made compression pedal is a beast. It takes up about the same amount of space as 2 standard size pedals and it seems like it’s built to withstand a nuclear war. 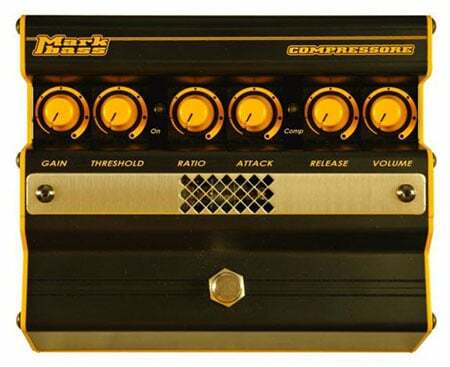 The big difference between this and most other pedals is that the MarkBass features a tube compressor instead of digital. What that means is that there’s way less noise, and it flavors your tone with quite a bit of warmth. There’s no shortage of dials here, so you’ll be able to fine tune the settings to your exact liking. You have all your standard compression settings - gain, threshold, ratio, attack, and volume. The LED meter on top is also a nice feature, and it lights up to let you know when your signal is being compressed. Even on very high compression there is little to no noise, and the sound is very smooth. The mids especially can get very thick sounding, and the lows sound larger than life. The upper end can sound a little dark at times, but it’s not completely rolled off and it sounds very controlled. It’s important to note that in order to power this thing you need a 12V DC power supply that can supply at least 500 mA current. If you can look past the high price-point, power requirements, and the large size, this compressor pedal can go toe-to-toe with some of the best studio-grade rack mounted gear and it’s an easy choice for the best sounding compressor pedal for bass. 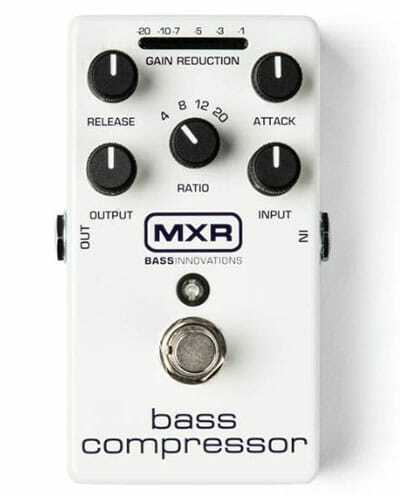 The MXR M87 is one of the most popular choices when it comes to bass compressors. It’s compact, has great sound quality, and it’s built to last. It’s a very good standard pedal that does what it’s supposed to do. It can be powered by either a 9V battery or a 9V DC power adapter which is great for portability. As far as the sound goes, it’s a very transparent sound and it won’t color your tone at all like the MarkBass does. It comes with your standard attack, release, and ratio knobs, and it also includes knobs for input and output levels. A big benefit of this pedal is that it includes a gain reduction LED meter so that you can see exactly how much compression your signal is getting and how often it kicks in. Usually this kind of thing comes with heavier price tags so it’s great to see it included on this mid-tier pedal. It takes some tweaking to get it how you want, so if you are looking for a simple 1-knob compressor I’d like elsewhere. I also wish the battery compartment was a little easier to get to, but that won’t be a problem unless you are constantly changing batteries and not hooked up to a wall outlet. Another solid choice for a compression pedal, the Keeley is based on the THAT 4320 circuit and delivers a clean unflavored tone with great clarity. The actual pedal looks great. It’s very stylish and the size is nice and small so adding it to your pedalboard collection should be no problem. As far as knobs go you get compression, threshold, and gain controls. Since the compression dial can go all the way up to infinity, it starts to act as a limiter if you want to protect your amps and cabinets from distortion when you really let loose. The red/green LED makes it simple to see when compression kicks in, so dialing in your perfect settings is made easy compared to going into it blindly. Though a little pricey, the Empress is a great option for those of you who want more control over your sound and aren’t afraid to dig in and get your hands dirty. It’s quite large, but you’ll have access to attack, release, ratio, input/output levels, and a handy mix knob for blending with your original untouched tone. One very unique feature of this pedal which makes it very versatile is the sidechain input. With this you can tell the compressor which specific frequency to focus on, but you'll need to hook up an EQ device via a Y-splitter cable to take advantage. Like other expensive models this one comes with a nice LED row to show you your compression in action. An unfortunate downside to this pedal is that the text markings under each knob are very hard to read, especially if you are playing in dim lighting.